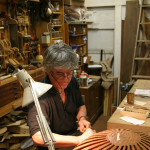 ON THE COVER – How To French Polish: Furniture maker, restorer and polisher Frank van Brunschot says ‘understand the basics but don’t get bogged down in theory as you experiment and practise to gain skill’. Shadow Sideboard: Master craftsman Neil Erasmus shares measurements and construction techniques for his mid-century modern inspired cabinet that features a unique mitred carcase construction along with elegant laminated handles. The Collectors: A special feature in which Wood Review readers and a few of our authors talk about the tools and timbers they treasure. 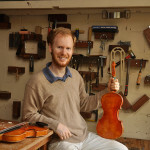 Played and Made: Joel Heard is a violinist who tells how he also came to make his own instruments and now enjoys teaching others to do the same. 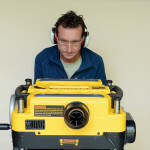 Through Thick and Thin: Andrew Potocnik puts three similarly priced benchtop thicknessers through the mill, and ultimately decides which one he will buy. 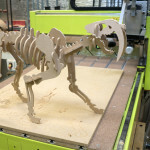 CNC for Small-Scale Use: Stuart Lees introduces a new series that focuses on choosing and using computerised machinery. 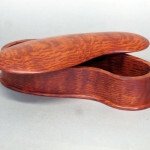 Reading the Grain: Understanding wood grain will help you to avoid tear-out and lead you to getting better results with your woodworking. Story by furniture maker and wood sculptor Robert Howard. 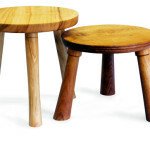 Heirloom Stool: Richard Raffan turns the seat and legs for a three-legged stool that recalls his family history. Frame and Panel By Hand: Get some peace and quite in the workshop with Damion Fauser’s unplugged joinery method that utilises tongue and groove planes. 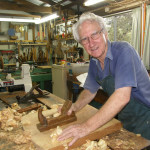 Shaped and Sawn: Neil Scobie shows a variety of tools and techniques for shaping a basic sawn lidded box. Machining Difficult Timbers: Troubleshooting tips and tricks for getting square and straight results every time when jointing. Tested: Jessem Prestige Router Table Package, Vicmarc Grinding System, Excaibur Magic Gripper Pro Gravity Clamps, Bosch GAS50 Workshop Vac, Striplox Pro55 Fittings, Tormek T4 Water-Cooled Sharpening System, Jessem Clear-Cut Stock Guides, Dust Deputy Deluxe. Products News: A round-up of tools and equipment to look out for. See here for our current fantastic subscription prizedraw offer.